« Prairie flameleaf sumac flamed out with respect to fall foliage this year. A very attractive casing. Who knew a moth could be so artistic. The moth built it just in case a predator was around, or an appreciator of art was casing the place. I was tempted to say, “Well, that’s an open-and-shut case, then.” But, in this case, it would actually be a shut and open case. Me too. She’s found lots of interesting things for me to photograph. I remember seeing those when I was a kid. Dad told me about them. The bags I saw were not fancy and decorative like this one. Then you were decades ahead of me in seeing one of these bags, even if less fancy. For all my time in nature, I don’t recall ever having come across another one. I don’t remember what kind of tree it was on. Our farm had few trees, mostly corn and bean fields. And I don’t recall what kind of sapling this was on, assuming I ever even knew. I can tell you for sure it wasn’t corn or beans. When I went searching online a few weeks ago I found pictures looking like that one, or maybe even that very one. What I didn’t find was an image of a case resembling the one in this post. Maybe this kind is less common. Wow! What a capture, Steve! I find this highly interesting… about how far off the ground/how far up was it? I’d say 3 or 4 feet off the ground. It sure was strange, wasn’t it? It took me 20 years to find the first one, so I don’t know if there’ll ever be another. Fascinating! Thanks for chasing down the mystery. You’re welcome. Fortunately there a few people who know a lot that I can turn to. Well. Speaking of predators being around, I’m wondering now if I caught a glimpse of a little predation taking place down at the Brazoria refuge. In 2016, I found what I’m sure was a starbellied orb weaver (Acanthepeira stellata) in the middle of its web. It kept going over to what I assumed was its egg case and fussing around. Here’s a photo that shows the spider and the case. Now I’m wondering whether I found a spider and its egg case, or a spider and a bagworm moth case. I’d completely forgotten about the little oddity until I saw your photo. What I’d assumed was a spider securing its own egg case might have been a spider securing a future meal. More exploration’s needed. Nature’s just full of little unknowns, isn’t it? 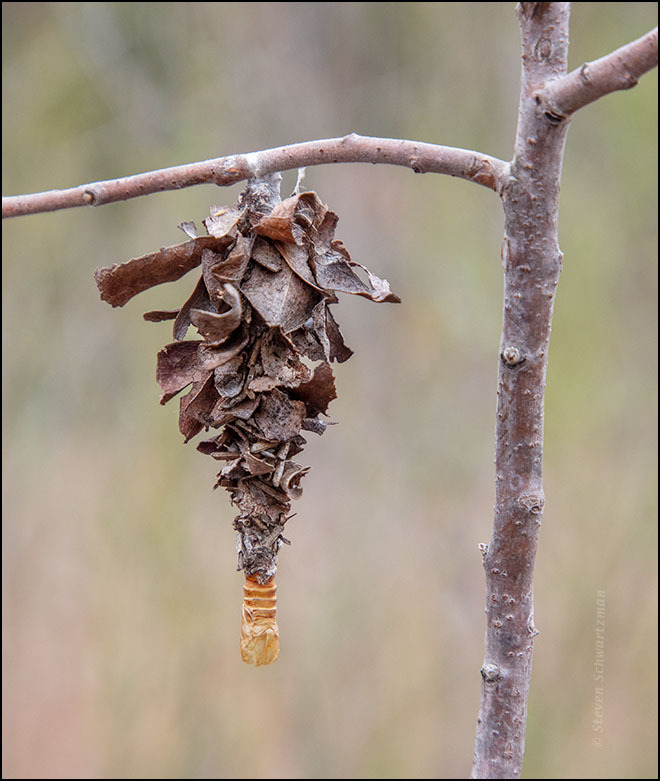 The thing in the right half of your picture certainly looks similar to the bagworm moth case shown here. I did a little searching for a picture of an egg case for your species of spider, including on bugguide.net, but didn’t turn one up. Some more-diligent searching might lead to a picture, or if you know any local entomologists maybe you could turn to them. Bagworms are cool. I’ve not seen their empty cases, just them carrying their collection of debris around on their backs. Now that you mention it, I think I also saw one moving around once, a long time ago. I still find them strange. That’s one way to look at it. No formal Christmas tree required. That would make a great holiday ornament! A rather offbeat one, I think, but go for it. You do have keen powers of observation, spotting this as something unusual, whereas, at least at first glance of your photo, I thought pine cone, then realizing that was wrong, a clump of leaves. The natural world is sure full of surprises. Same to you, as always from one S.Sch. to another. In this case I don’t know if I would have spotted the curious thing on my own. Eve found it and called my attention to it when I caught up with her. I’ve always assumed I miss at least as much as I notice. Pretty cool. I’ve seen these frequently over the years but never with the escape hatch open at the bottom. Then you’re well ahead of me, as this was the first of its type I recall seeing. I did once see a different type. I’m glad to have revived that happy memory from so long ago. Yes, along with the look on my mother’s face when I’d found a nest of baby garter snakes and came running with a fistful of wriggling little snakes to show her. Teehee. She locked the door!! Too bad nobody got a video of that.